SS UNS S31700 / S31703 Spherical Washers, Stainless Steel DIN 1.4449 / 1.4438 Lock Washers, 317 SS Spring Washer, Stainless Steel 317L Square Washer Manufacturer & Stockist in Mumbai, India. Asiad Steels is one of the known stockiest and suppliers of SS 317 / 317L Washers, which is being used for extensive application in diverse industries. We are ensuring the customers by giving them quality Stainless Steel 317 Washers in varied range as per their requirements. The entire range of Stainless Steel 317L Washers has received huge appreciation for their exclusive Features of SS 317 Lock Washers such as durability, corrosion resistance and high tensile strength. SS 317L Spherical Washers is provided in numerous specifications as per the needs of customers. Buy Stainless Steel Washers at cost-effective price from us. Alloy 317 Washers (Din 1.4449 Washers) Stainless Steel 317 Flat Washers is the most corrosion resistant of the 300 Series alloys and possesses the highest tensile and creep strength properties at elevated temperatures. Stainless Steel 317 Punched Washers can be hot worked using all common hot working procedures. It is heated at 1149-1260 Degree C (2100-2300 Degree F). Stainless Steel UNS S31700 Machined Washers is often used in textile, pulp paper and chemical equipment, for corrosion resistance. 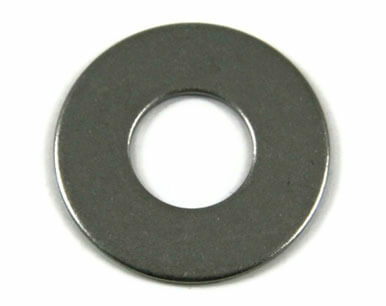 Alloy 317L Washers (Din 1.4438 Washers) Stainless Steel 317L Round Washers requires low speeds and constant feeds to reduce its tendency to work harden. Stainless Steel 317L Square Washers is non-magnetic in the annealed condition but may become slightly magnetic as a result of welding. Stainless Steel UNS S31703 Spring Washers is commonly used to handle sulfur, pulp liquor, acid dyestuffs, acetylating and nitrating mixtures, bleaching solutions, severe coal and oil, and many chemical compounds. ASTM A 193 / ASME SA 193 SS Round Washer, Stainless Steel 317 Machined Washers, SS 317L Punched Washer, Stainless Steel 317 Flat Washers, SS 317/317L Fender Washer Supplier & Exporter in India. We are Exporter of SS 317 Washer in Worldwide Such as India, Peru, India, Lebanon, Bolivia, Thailand, Venezuela, Mexico, New Zealand, Saudi Arabia, Jordan, India, Philippines, Norway, Netherlands, Spain, Morocco, Bhutan, Ghana, Azerbaijan, China, Bulgaria, Denmark, Sri Lanka, Canada, Lithuania, Afghanistan, Gambia, Qatar, Iraq, Malaysia, Estonia, Pakistan, Poland, Turkey, Czech Republic, Poland, Kenya, Iran, France, South Korea, Libya, Macau, Australia, Ecuador, Germany, Iran, Austria, Oman, Costa Rica, Chile, United States, Hungary, Chile, South Africa, United Arab Emirates, Gabon, Nepal, Finland, Mexico, Indonesia, Slovakia, Colombia, Israel, Tibet, Algeria, Russia, Peru, Ukraine, Nigeria, Italy, Japan, Bahrain, Namibia, Belarus, Serbia, Portugal, Angola, Trinidad & Tobago,Tunisia, Belgium, Nigeria, Egypt, Ireland, Romania, Hong Kong, Mongolia, Kazakhstan, Sweden, Vietnam, Singapore, Taiwan, United Kingdom, Greece, Switzerland, Yemen, Bangladesh, Puerto Rico, Zimbabwe, Kuwait, Brazil, Croatia, Argentina. We are Suppliers of Stainless Steel 317L Washers in India Such as Abu Dhabi, Hyderabad, Noida, Riyadh, Dammam, Ernakulam, Colombo, Aberdeen, Ulsan, Los Angeles, Tehran, Perth, Lagos, Cairo, Bhopal, Pimpri-Chinchwad, Ahmedabad, Manama, Busan, Houston, Caracas, Thane, Jakarta, Nashik, Coimbatore, Haryana, Seoul, Kuala Lumpur, Jaipur, Ranchi, Thiruvananthapuram, Indore, Ahvaz, Singapore, Montreal, Granada, Edmonton, Melbourne, Bogota, Rio de Janeiro, Vadodara, Chandigarh, Al Jubail, La Victoria, Dallas, Jeddah, Chiyoda, Petaling Jaya, Chennai, Courbevoie, Doha, Brisbane, Ludhiana, Muscat, Navi Mumbai, Geoje-si, Gimhae-si, Ho Chi Minh City, Secunderabad, Madrid, Surat, Atyrau, Al Khobar, Gurgaon, Port-of-Spain, Dubai, Karachi, Kolkata, Milan, Kanpur, Baroda, Kuwait City, Jamshedpur, Howrah, Rajkot, New Delhi, Bengaluru, Ankara, Nagpur, Mexico City, Toronto, Faridabad, New York, London, Hanoi, Moscow, Sharjah, Hong Kong, Visakhapatnam, Istanbul, Calgary, Algiers, Bangkok, Mumbai, Santiago, Lahore, Pune, Vung Tau, Sydney.